Setting up a bar at home, even if you only drink occasionally, creates an opportunity to cater to guests. A well-crafted and fully stocked home bar can provide nearly as many options as the neighborhood pubs without all the noise and crowding. Whether you have a large outdoor space available or a small corner in the room, setting up a bar at home is possible. Outdoor bars are easy to customize and help encourage family and friends to gather outdoors when the weather is nice or when you expect a large number of guests. Pass-through bars work well when you’re limited on space. By opening up a window and adding a few extra shelves, you can increase the amount of available space. No matter the style you choose, setting up a bar at home requires planning ahead. Placement is important. 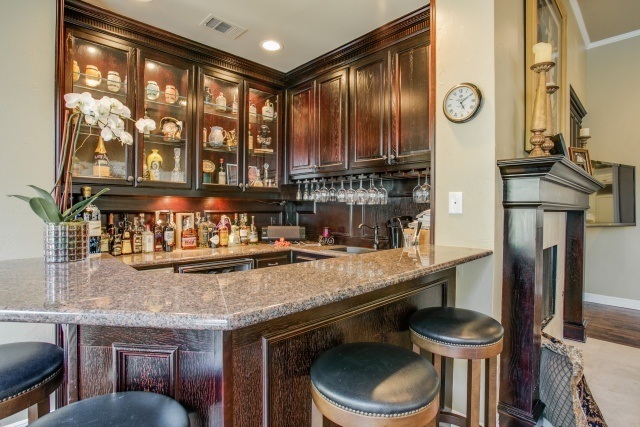 You want your home bar to be conveniently located for you and your guests to make the most use of it. If you’re creating a dry bar, consider how you will dispose of leftover drinks and garnishes, as well as where you will wash glassware. Dedicating enough storage space is also essential. A standard bar set up includes a jigger, a corkscrew, a paring knife, a cocktail shaker, a muddle, a bar spoon, a strainer and an ice bucket at minimum. In order to make most of the classic and popular cocktails, you need a well-stocked bar that includes gin, vodka, whiskey (including Scotch and bourbon), white rum, dark rum, tequila and cognac. Having a wide variety of mixers on hand allows you to make classic drinks as well as experiment with new flavors and pairings. Bitters, soda water, tonic and ginger beer are four essential mixers to keep stocked. Also consider Cointreau, red vermouth, white vermouth and fresh juices. Keep a supply of short, tall and stemmed glasses in your home bar. Six to twelve short and tall glasses are generally enough for most gatherings, but if you host larger gatherings, you’ll want to stock up on glassware. When you’re setting up a bar at home, keep in mind you need a place to store garnishes such as salt, sugar cubes, pepper, cocktail olives, horseradish and hot sauce. You’ll also want to include a collection of coasters or cocktail napkins. If space allows, keep a mini-fridge nearby to chill beer, wine and glassware. Setting up a bar at home is an enjoyable way to display your creativity and taste while making a usable space for you and your guests. A home bar, like any other addition to your house, is an investment that shouldn’t drain your pockets or stress you out. This project is one that you are meant to enjoy so have fun with it. Are you looking for more ways to add some design to your home? Take a look at our tips for Design and Decor.